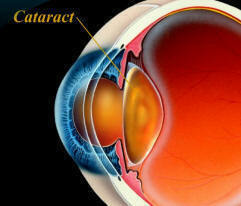 A cataract is an opacity or cloudiness in the natural lens of the eye. It is still the leading cause of blindness worldwide and represents an important cause of visual impairment in the United States. 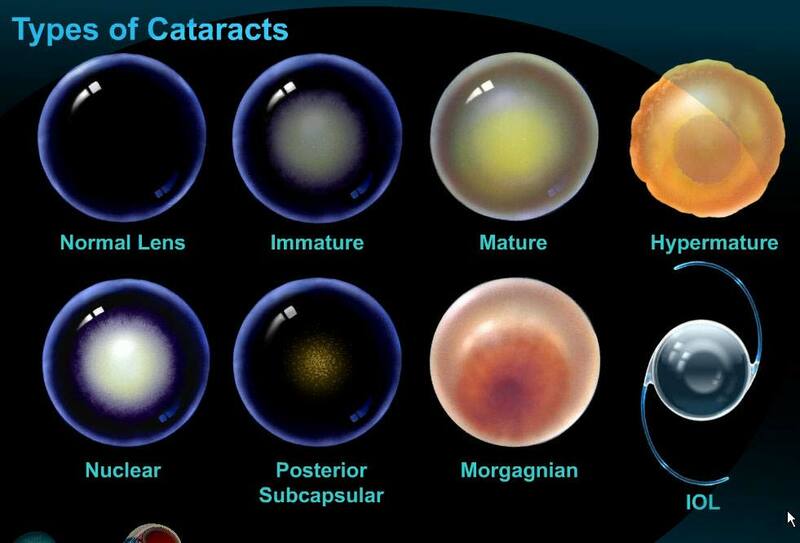 The development of cataracts in the adult is related to aging, sunlight exposure, smoking, poor nutrition, eye trauma, systemic diseases, and certain medications such as steroids. A single study has suggested that use of oral vitamin C may help delay the progression of cataracts. Just as a smudged or dirty camera lens may spoil a photograph, opacity in the natural lens of the eye can result in a blurred image. Patients with cataracts usually complain of blurred vision either at distance, near, or both. This may interfere with tasks such as driving or reading. Other common complaints include glare, halos, and dimness of color vision. A diagnosis of cataract can only be made by a thorough eye examination including slit lamp (microscopic) evaluation. Other devices are sometimes used to determine if glare interferes with vision. If cataract surgery is being considered, an ophthalmologist will also examine the posterior aspect of the eye, which will include evaluation of the retina and optic nerve. The progression of cataracts is highly variable, however, they will invariably worsen in severity. Changing glasses may sometimes be useful in improving vision as the cataract progresses, since cataracts may induce relative nearsightedness. This is the answer as to why some patients with hyperopia (farsightedness) will actually have better vision without glasses in the early stages of cataract development. For most patients, however, changing glasses has minimal impact on overall visual quality. Besides changing glasses, the only other option for treatment of cataracts is cataract surgery. Before the development of small incision cataract surgery and intraocular lens implants, outcomes with cataract surgery were far inferior to outcomes today. Therefore, ophthalmologists would typically wait until a cataract was very advanced before offering surgery. Today, with advanced surgical techniques and equipment, cataract surgery can be offered at a much earlier stage. In fact, most ophthalmologists will agree that it is safer to proceed with cataract surgery at an earlier stage of development rather than waiting until the cataract is advanced and very dense. 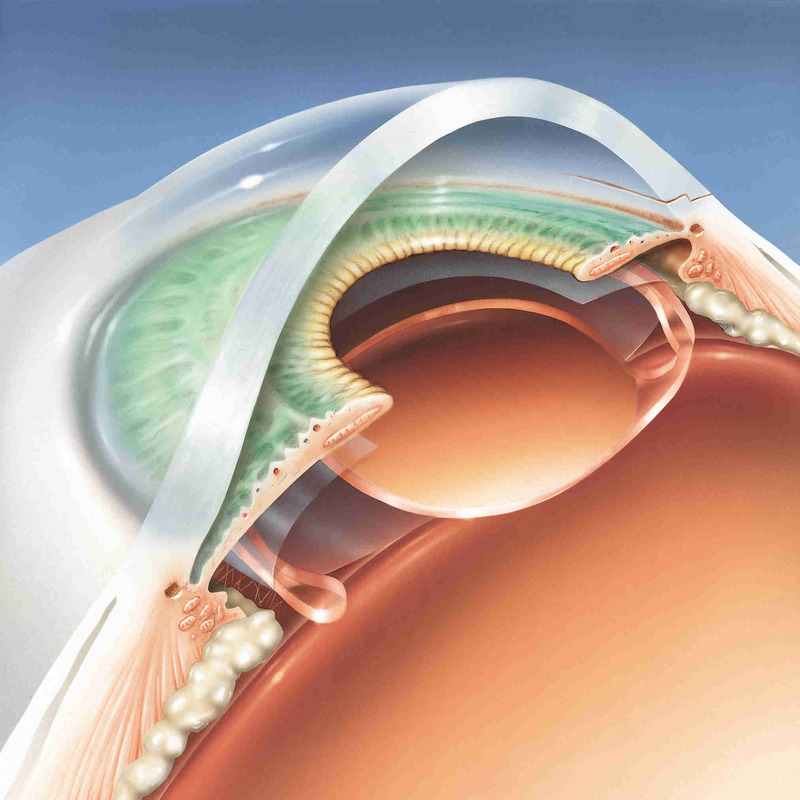 When a cataract is removed, it is replaced with an artificial intraocular lens (IOL). There are a variety of IOLs that can be used in cataract surgery, and they each have their own set of advantages and disadvantages. No single IOL works best for everyone, and only your ophthalmologist can determine the most appropriate IOL for your needs. The FDA approval process for IOLs is among the most rigorous in the world. You can rest assured than any IOLs used in the U.S. have undergone very extensive testing for safety and efficacy. These same IOLs are also used for a refractive surgery procedure known as refractive lens exchange. In refractive lens exchange, the IOL is used solely in an attempt to reduce or eliminate the need for glasses or contact lenses. This article outlines some of the choices of IOLs that are available for use in cataract surgery and refractive lens exchange. Fixed Focus Monofocal IOLs are used in the majority of cataract procedures. These lenses have the advantage of excellent quality distance vision under a variety of lighting conditions. Since these lenses have a fixed focal point which is generally set for distance vision, reading glasses are typically required for good near vision(1). For patients willing to use reading glasses for near tasks, these IOLs are an excellent choice. Several million lenses of this variety have been used for decades with an excellent safety record. Recent refinements in the optical quality of these lenses have allowed an even higher quality of vision than previously achievable. Multifocal IOLs use a different strategy to achieve good distance and near vision without glasses. These lenses have highly specialized optical properties that can divide light to bring it into focus at more than one point at the same time. This allows the eye to see both near and far, usually without glasses. Excellent results for distance and near vision have been achieved by both of the FDA approved lenses of this type. The ReZoom™ multifocal IOL has several zones of optical power that are designed to provide good vision at varying distances, under varying lighting conditions. In a clinical study, 92 percent of ReZoom™ IOL patients reported never or only occasionally having to wear glasses. Another multifocal IOL is the ReSTOR™. This IOL uses a patented diffractive optical design to divide light into two focal zones so that near and distance objects can both be seen without glasses. An impressive 80% of patients from the ReSTOR FDA trial reported that they never wore glasses after the procedure(3). Multifocal IOLs have a slightly greater tendency to cause night vision complaints than other IOLs, so those who drive a great deal at night may wish to consider a different IOL. The vast majority of patients with these IOLs are not bothered by night vision complaints, however. Cataract surgery today is typically performed using a micro incisional procedure. To the patient, this means minimal discomfort during or after surgery, a more speedy recovery of vision, and reduced risk of induced astigmatism. This means less dependence on glasses afterwards. Below, we’ve detailed the major steps of cataract surgery using a micro incision procedure, phacoemulsification (ultrasonic cataract removal), and a foldable lens implant. 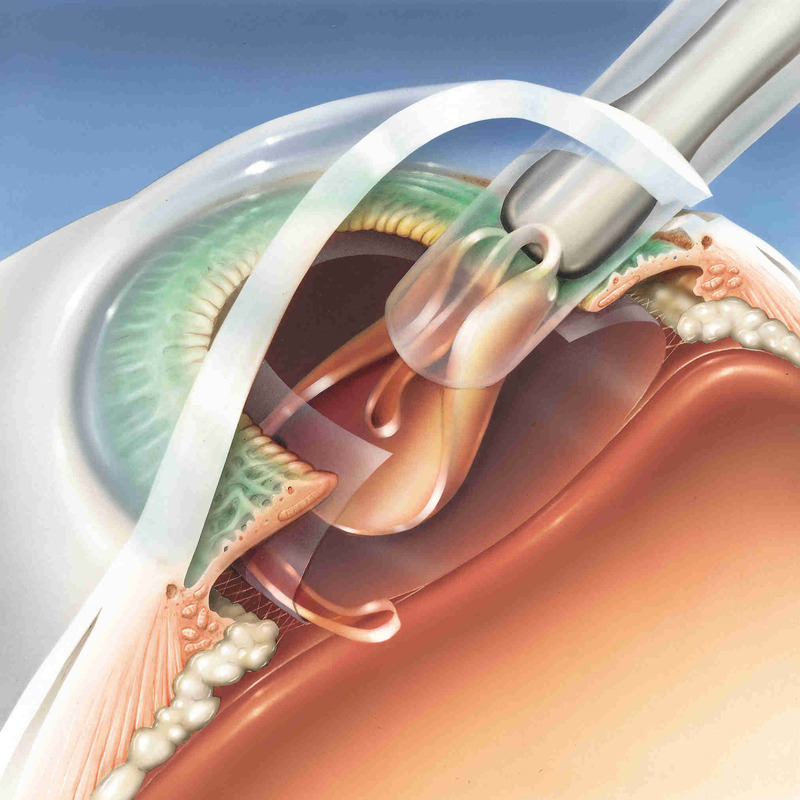 This type of procedure is considered state-of-the-art for cataract surgery today. The procedure demonstrates basic principles only, however, and eye surgeons use many variations of the general theme, even from one case to another, depending on the type of cataract being removed. The most commonly used cataract incision is about 3 millimeters in size – just about one-eighth of an inch! Because of the careful construction of this incision, and its small size, the incision is generally self-sealing. This translates to a “no-stitch” type operation. The surgeon then creates an opening in the capsule, which is a micro-thin membrane surrounding the cataract. This procedure, called capsulorhexus, requires extraordinary precision since the capsule is only about four-thousandths of a millimeter thick! This membrane is actually thinner than a red blood cell and the surgeon must delicately remove the capsule while manipulating instruments within the anterior chamber – a space only 3 millimeters deep! 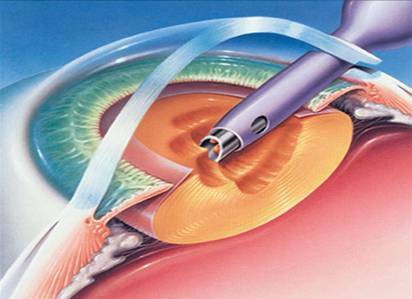 Once the denser central nucleus of the cataract has been removed, the softer peripheral cortex of the cataract is removed using an irrigation/aspiration hand piece. The The posterior, or back side, of the lens capsule is left intact to help support the intraocular lens (IOL) implant. The intraocular lens is often folded and passed through the tiny incision where it is opened (implanted) inside the “capsular bag”. In this illustration, the lens is being inserted via an “injector”. This is an instrument designed to help keep the incision size small while allowing implantation of a 6 millimeter lens through a 3 millimeter (or even smaller) incision! The IOL is shown here implanted within the “capsular bag” where it is neatly centered. The springy “arms” of the IOL, known as haptics, hold the lens implant within the capsular bag. The IOL does not generally require sutures to remain in good position. This lateral view of the IOL implant shows the lens within the “capsular bag,” which is the desired location. This position is the same as that of the natural lens (cataract) of the eye and, therefore, is generally tolerated best and provides the most optimal visual results. At this stage, the cataract operation with IOL implantation is complete. Modern cataract surgery is performed almost exclusively on an outpatient basis. Most patients will be asked to arrive at the surgery center about an hour prior to surgery. Prior to surgery, a number of eye drop medications will be applied to the eye to prevent pain, to reduce inflammation and the risk of infection, and to fully dilate the pupil. The surgery is typically performed under local or topical anesthesia. With local anesthesia, the entire eye and eye muscles are numbed to prevent discomfort. With topical anesthesia, just the front of the eye is numbed. Either type of anesthesia allows the procedure to be performed painlessly. The type of anesthesia chosen depends on surgeon preference and many patient variables. During surgery, most patients remain fully awake, however, mild sedation may be used depending on physician and patient wishes. The patient is asked to lie still during surgery and, if the procedure is performed with topical anesthesia, the patient will usually be asked to look toward the light of the operating microscope. Surgery is usually completed in just 20 to 30 minutes. Patients are asked to remain still during the procedure and to inform the surgeon if needing to cough or otherwise move for any reason. Once the surgery is complete, the patient will be briefly monitored, post-op instructions given, and in most cases, the patient may be discharged to home within an hour. After discharge from the surgery center, patients will usually be asked to return for a follow-up visit later that day or the next day, however, this will be based on individual circumstances. Also depending on the type of incision and surgeon preference, some patients will be asked to wear a shield over the eye, particularly while sleeping. The eye should not be rubbed, or pressure placed directly on the eye through the eyelid, during the first few weeks following surgery. Eye drop medications will be required, usually consisting of antibiotic and anti-inflammatory medicines. These will often be tapered off during the first month after surgery. The best vision may not be obtained until several weeks following surgery, but individual results vary considerably, depending on many variables. The great majority of patients may resume normal activities on the day of or day after surgery. Activities such as reading, watching television, and light work will not hurt the operated eye. Most surgeons arbitrarily recommend waiting 4 to 6 weeks before new glasses are obtained. This allows the eye to achieve considerable stability from a refractive standpoint and, therefore, the glasses prescription should be accurate and relatively stable. Many patients are surprised at how clear their vision is after cataract surgery. Some patients may have better vision than they ever did before cataract surgery. Furthermore, depending on the degree of refractive error (need for glasses) prior to surgery, many patients will be much less dependent on glasses for far vision than they were before surgery. Patients will often notice that colors are brighter and more brilliant. The results are often dramatic. Though cataract surgery is one of the most successful procedures in all of medicine, complications may still occur. Potential complications range from devastating visual loss to minor inflammation in the eye following surgery. In general, the risk of severe visual loss is very rare, but may occur as a result of infection or bleeding inside the eye, or even retinal detachment, which may occur months or years after a perfectly successful cataract procedure. Most complications are minor, such as swelling of the cornea or retina, increased pressure in the eye, and droopy eyelid. These complications usually resolve with medications and continued healing time. Over 98% of cataract surgeries are successfully completed without surgical complications, and more than 95% of patients have improved vision. Those patients whose vision fails to improve often have underlying ocular disorders, such as age related macular degeneration (ARMD), diabetic retinopathy, and other conditions. In some cases, these patients may benefit from other procedures or from low vision aids. Cataract surgery today is truly a miracle of modern medicine. With the collaborative efforts of physicists, bioengineers, and EyeMDs, modern cataract surgery has reached a new pinnacle of success. If your vision has faded as a result of cataracts, your likelihood of recovering more youthful vision with cataract surgery is exceedingly high. If you choose to have cataract surgery, you will likely enjoy a rapid recovery of enhanced vision with little disruption to your lifestyle.